Before sending your dog out for professional training, you can save both time and money if you follow the outlines I have developed for starting your pup properly. 10 minute sessions as often as possible. Keep these sessions “playful”. Also keep in mind these are just guide-lines. All dogs learn at a different pace. Be mindful not to bore or put pressure on your puppy. Do not over use commands. Instead use the command one time and reinforce it by teaching the dog what you are looking for. Timing is important! Start by introducing your pup to as many noises as possible from an early age. I do not recommend that your dog be shot over until they are around eight months old. There inner ear is still developing up until then. Do not take this process lightly. 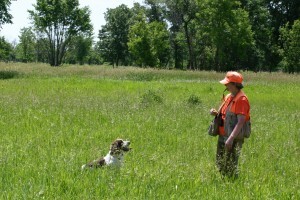 This is just an introduction and care should be taken until your pup thoroughly understands the relationship between gunfire and game. The first shots you fire should be in the middle of a wide open field away from a tree line. 1. 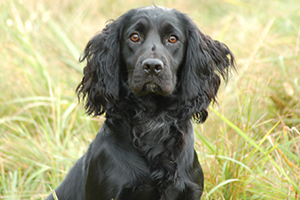 By now your pup should have been introduced to a lot of different noises, been shown many types of cover, has had a retrieve or two of cold game, has a good quartering pattern started and is happy to make a retrieve. 2. Start by letting your pup hear gunfire at no less than 200 yards during a training session, while they are crated in a vehicle. The first time you do this, observe the puppy carefully and do not say anything. After the gunfire is over take the pup out to investigate, smell the scents and have a run. 1. Repeat Step C at the same distance this time having your helper fire the .22 crimp in the air as he throws the bumper. Q. How do I stop my dog from making noise? A. Be careful not to reward the dog when making noise. Teaching the dog to relax can help this problem. Q. What is free feeding? Q. Is free feeding a good idea? Q. Where should I feed my dog? Q. How many times a day should I feed. Q. How do I stop my dog from bolting out the door? A. Absolutely!!! This is a safe haven for your pet. This is where he will learn to relax. Q. My dog is in the house with me. Do I still need to use a crate? A. Absolutely!!! It will help him settle. Q. What type of lead and training collar should I use? Q. What is a flex lead. Q. How do you use a whistle in training? Q. What type of whistle do you use? Q. My dog does not listen to commands. What should I do? Q. What is gun nervousness ? Q. How can I avoid Gun Nervousness? Q. My dog will not bring things back to me. How do I train him? Q. I am thinking of getting a Pup. Should I get 2 to keep each other occupied? Q. A breeder I know keeps 2 dogs out of each litter she breeds. Why? Q. Should I consider buying an older dog? Q. Will an older dog bond to me? Q. I am looking at getting a hunting dog. What is a started dog? Q. What should I expect out of a started dog? A. A good response to basic commands needed for that particular breed. Q. What is a finished dog?